With the Super Bowl fast approaching I thought I’d offer a little snack that would be perfect for sharing around the television during the game. 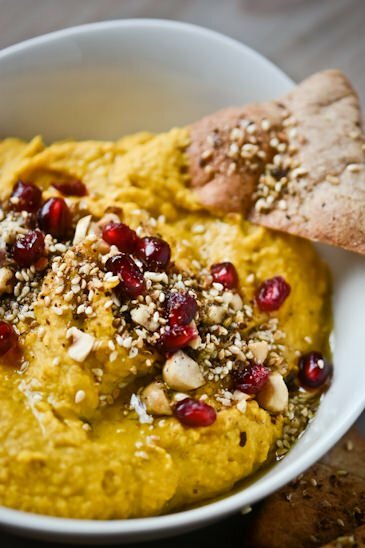 Slightly more sophisticated than your traditional Velveeta cheese dip but just as delicious, this savory pumpkin hummus is packed full of flavor. Dukkah is traditionally an Egyptian spice blend used as a dip with bread and olive oil but since I made a batch from scratch I’ve been finding all sorts of uses for it. It’s great sprinkled on top of scrambled eggs or on top of pasta and would be great to dip veggies into with a little olive oil. 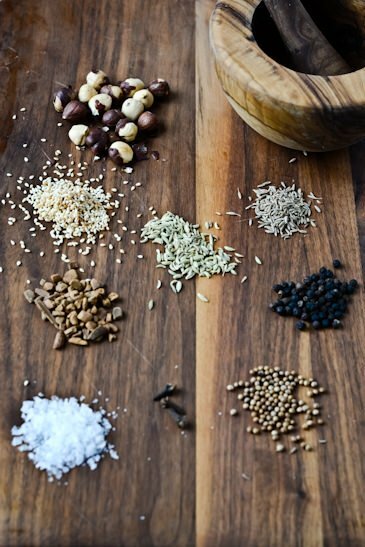 There are lots of variations of dukkah but most all of them consist of some kind of nuts and seeds. I took some of my favorite flavors and came up with a mixture that I liked but feel free to try some other spices if you’d like. For a little more heat you could add some cayenne or aleppo pepper or switch out the hazelnuts with peanuts or pistachios. 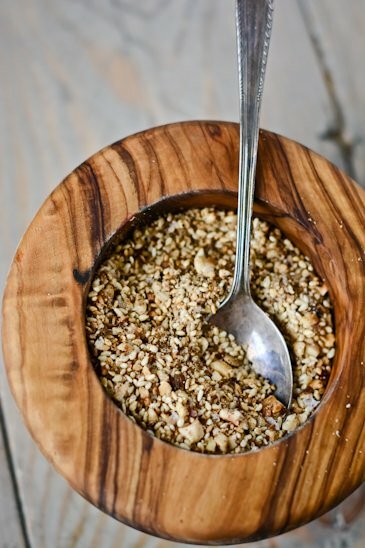 This Egyptian crumbly nut and seed mixture is traditionally served as a dip with bread and olive oil but can be used on top of roasted vegetables, pasta or even fruit. Heat a heavy skillet over medium heat, add the sesame seeds and dry-toast until slightly browned and fragrant. Repeat with all the remaining seeds and peppercorns. 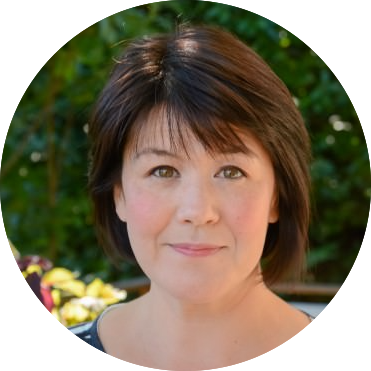 Allow them to cool and then add the nuts, seeds, peppercorns and salt into a mortar and pestle or spice grinder and grind until the mixture is crushed. If you are using a spice mill just pulse the mixture lightly, do not allow it to turn into a paste. 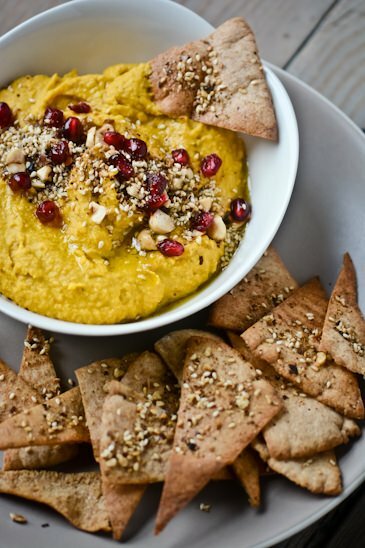 Pumpkin hummus seasoned with homemade Egyptian Dukkah. 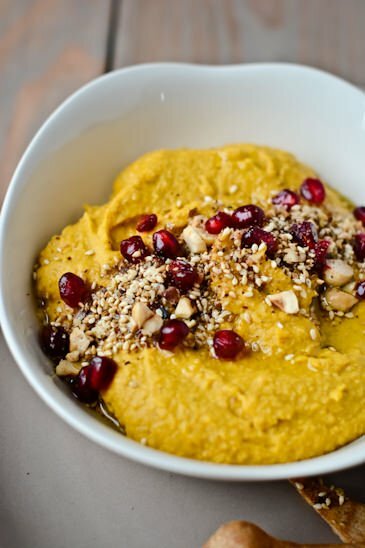 For the hummus: Place all the ingredients in a food processor or high speed blender and puree until smooth. Season with salt and pepper. 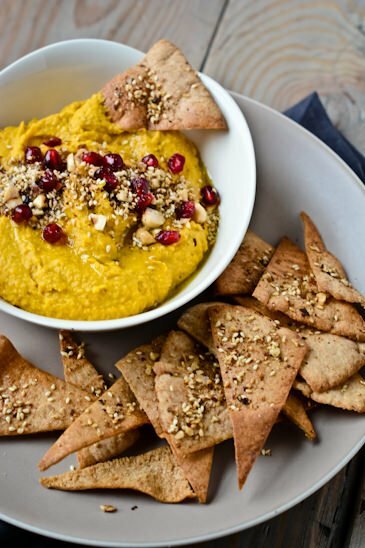 To serve, sprinkle the pomegranate seeds and dukkah over the top and serve with the pita chips. Pre-heat the oven to 375 degrees. Line a baking sheet with parchment paper and lay out the pita wedges in a single layer and brush each side with olive oil. Sprinkle the dukkah over the top. Bake for 7 to 10 minutes until the chips are crisp and golden brown. Serve with the hummus.